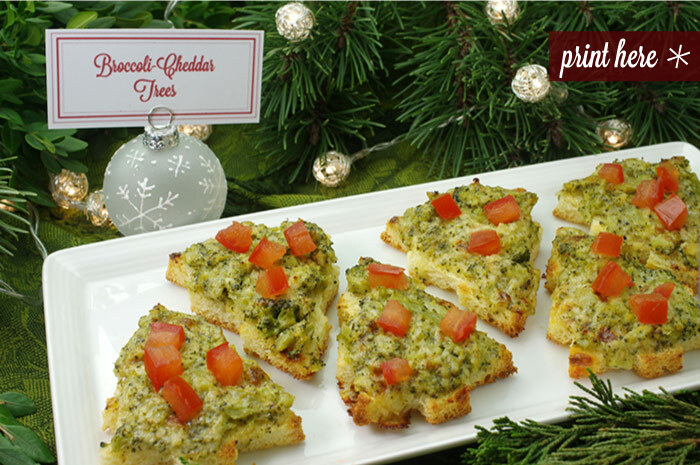 These appetizers fall into the category of holiday fun! 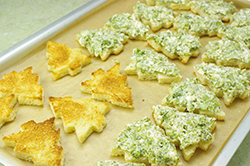 The tree shapes set the seasonal tone, and the broccoli-cheese topping colors and puffs some personality into each one. In the tradition of cheesy toasts, the broccoli is a natural addition, and a delicious one at that! Choose other seasonal shapes or other vegetables – they’ll all work similarly in this recipe. Try serving these veggie treats alongside a hearty soup for a delicious lunch or light supper. Bake any extra filling in a small baker as a hot dip. 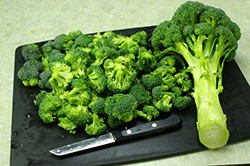 (1) Prep the broccoli by cooking in boiling water for 4 minutes or until just tender, yet still bright green. Use just the top floret portion of the broccoli – no thick stems. Drain, then halt the cooking by immersing the broccoli florets in cold ice water. Drain well in a colander, then chop finely. 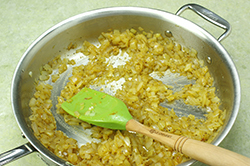 (2) Finely dice a large onion, sauté in a large sauté pan with the olive oil until translucent and tender about 5-6 minutes. Add the crushed garlic in the last minute of sautéing. Add the salt, black pepper, cayenne, pepper, and white wine, stir and reduce. Allow to cool. 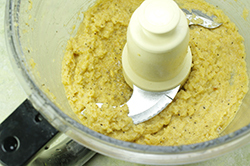 (3) Transfer the cooled onion mixture to the work bowl of a food processor, process until pureed. Add the mustard and mayonnaise and process again. 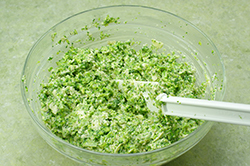 Transfer the pureed onion mixture to a bowl, stir in the cooled, finely chopped broccoli. 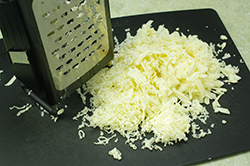 Follow by stirring in the shredded cheddar cheese. Chill the mixture until ready to use. 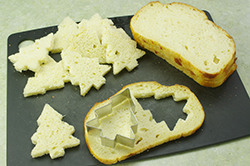 (4) Using tree-shaped cookie cutters (or a shape of your choice), cut out shapes from the bread slices. Toast the bread in a 400°F oven, just until the edges begin to brown; watch carefully. 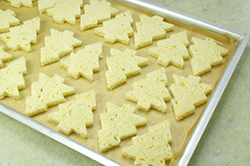 (5) Spread a spoonful of the broccoli mixture on the toasted trees. Change the oven to broil mode and broil the topped trees for 3-4 minutes or until the broccoli is puffed and begins to turn golden brown; monitor carefully. Serve immediately; top with a sprinkling of chopped tomatoes. (1) Mix the broccoli topping up to two days. (2) Cut the trees from the bread; store in an airtight bag.